In much earlier years I unknowingly stored information about whitetails that would come back to the forefront in a useful manner when my own hunting experiences shifted from an avid waterfowl hunter to that sport which has brought you to DeerFever. Hunting the elusive whitetail deer. And, if you’re looking no further than the water’s edge, you may be sinking in a shoreline of muddy misconception. It didn’t take me years to understand the connection and necessity of the whitetail and it’s need for fresh water supplies. That’s a given. Basically this is viewed much the same as humans where we need food, shelter, and water, for survival. Although the need for shelter aspect is obviously askew to that of our own, and can be debated in the human hierarchy, the majority of us have staked a meager claim to a residence of one form or another. Much like that of the deer without the amenities. Regardless of the shelter and food aspect the basic foundation of existence centers a great deal around that very simple liquid substance. Water. And the very existence of larger bodies of water can in return provide temporary shelter for whitetails when the hunting heats up. As a waterfowl hunter I had mentally noted that in most instances there were abundant signs of deer both along the shorelines of our favorite waterfowl hunting areas and in most cases further signs of deer in areas that I would normally not view as daily travel patterns. Again, it’s a given to find deer tracks along the shoreline of many waterfront lakes and bays that have accompanying forest or tactical gateways that allow deer to move through the area relatively undetected. But, would you expect to see signs of deer on a small knoll that rises up from the bay that is nearly one hundred yards from the shoreline? The route to this knoll requires wading through water levels that average to the knee joint on a human. Most would view this as a deterrent to a deer but this is not always the case. Especially during the firearm season when pressure from hunters increases. I’ll explain a bit more through several scenarios. By chance on a gorgeous fall afternoon I came across a lone doe standing broadside 40 yards upwind of a slight breeze in a red pine plantation. This area was merely the transition between where I was heading to my treestand that later broke into a mature conifer forest. The route was easy to walk in between the rows of plantings and offered nearly silent entry on a bed of moss and pine needles. I wasn’t looking for a buck in particular as much as I was interested in putting some venison in the freezer. At three in the afternoon my arrow slid through the air and caught the deer a bit too far back. Nobody’s perfect. She was gone in a flash leaving behind nothing but a memory and myself wondering what went wrong with the shot. I sat beside one of the small pines listening for 20 minutes before following up on the area where she stood when my arrow connected. Sparse blood right at the scene was evident and that would be tough to follow given her rate of speed when the doe fled the area. I made the decision to leave and return with a friend for a follow-up at about 5 in the afternoon figuring the deer would probably be just inside the conifer swamp where I had hung my treestand. The track was fairly uneventful from the point of contact but was picked up later nearly right at the edge of the swamp. Blood was still sparse but it was evident that the deer had ceased her quick retreat and was now walking along a decent trail. Evidence that, in many cases, the deer is wounded severely and seeking the easiest and most trusted route for eluding detection. It seemed at this point that the shot was further back than I had initially expected as the deer continued through the swamp and into an area that was completely flooded due to a river that had been dammed by a pair of beavers. The search was now completely visual as we scanned the area for the deer. I have to admit that at this point neither myself or my friend were very enthused about the situation as we trudged through knee-deep water with the basic rubber boots that offered no protection from the cold water. It was at that point where we heard water splashing ahead of us. Not just a single splash of water either. It sounded like a herd of buffalo moving through a river. I could continue with numerous other aspects of deer relating to bodies of water such as this but, for sake or holding your attention, I will briefly reference a similar instance and follow through with some techniques for hunting these areas and identifying the more productive aspects. During a November firearm season here in Michigan I placed myself along the shores of well-known duck hunting spot that took place at the edge of Big Bay de Noc. The area itself was a mix of trees that bordered the shoreline with a very well worn deer trail that skirted parallel to the water. I was facing the Eastern sky which by all accounts wasn’t my ideal choice. With a view of the sun rising in the background of a dark blue bay I envisioned the silhouette of a tall-tined buck accessing the trail I had positioned myself to hunt. This was one of those places that really came alive each morning with numerous songbirds, ducks in the distance, grouse moving about the forest floor and, most of all, deer sauntering past with no inclination of my presence. Within the first hour and a half of sunrise I had watched a half dozen does and three small bucks use the trail. All deer headed in the same direction back to their bedding area which I had figured was the still active clearing I had scouted earlier in the year. With the heat of the rut in full swing I decided to pass on the small bucks and hold-out for any one of the elder equivalents that I knew were in the area. Another hour had passed with no more than a single doe passing by the trail and fading out of sight. I suppose you could categorize my state of mind as drifting off momentarily at this point as the only notable action was the sound of distant gunshots echoing through the forest from what I surmised must have been another fortunate hunter. It was at that moment when I caught a glimpse, at least thought I glimpsed, a deer walking through the reeds out beyond the shoreline. I peered through my binoculars just in time to verify that indeed this was a deer fading into the reeds. Surprised, I scanned the surrounding area and was able to identify three more deer, all does, making their way through the reeds. Shortly after a small buck was heading in the same direction followed by what appeared to be another buck of the same stature. That’s when the storyline fell into place. The same deer I had witnessed earlier on the trail were using the safety of the reeds and water rather than the bedding area I had scouted earlier in the year. In relation this change of daily routine appeared to be in reflection due to the increased activity of the firearm season. I knew from my previous duck hunting in the area that these deer could move along the entire shoreline without being detected. What struck me most was the fact that the rut was in place and I viewed no activity of chasing, or, dogging as some call it, by the bucks. On that note there was always constant movement from the reeds themselves as they swayed in the wind generated by the bay. From my point of view I wondered if the breeding was also taking place within the confines of the reeds. I simply couldn’t tell. It was within the next half hour of trying to catch a quick glimpse of the deer through the reeds when my season would end as a ten point buck walked the trail I was watching 50 yards from my vantage point. I can only imagine that he too was headed for the reeds in order to prove his social hierarchy to the younger bucks and breed with the does that had wandered past earlier in the morning. He wasn’t the tall tined whitetail I had imagined but sported a very sturdy and respectable rack of antlers. Coincidentally the buck dropped in it’s tracks and I expected to literally see a herd of deer bounding from the reeds for thicker cover when my shot rang out but nothing happened. Not even a tail waving in the distance was viewed. For most deer hunters these situations would be gauged as beyond the norm and not reviewed with any merit. In truth, deer will utilize any means of survival and alternate means of survival accordingly when situations dictate the circumstances. Just like the deer in these scenarios, water can become the equivalent of safety and survival especially when hunting pressure heats up. So let’s take a look at the possibilities for identification and hunting these whitetail hotspots. First, unless you’re planning to hunt from or travel to these areas with a canoe or kayak you might as well relinquish the fact of sneaking up or stalking these deer. 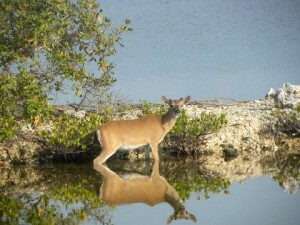 Many states do not allow the shooting of deer while they are in the water to begin with. Shooting high powered rifles from a watercraft are also prohibited in many states. This leaves the option of stalking the area. Good luck. Not to say it couldn’t be done because obviously it could. I just don’t see the percentages working in the hunters favor and with an animal like the whitetail deer we should always attempt to tip the odds our way for a slight edge. For one it’s highly unlikely that you could move through the water without creating a lot of noise even with the very best foot placement. And another drawback would be the fact that you would shooting at deer on the move with a lot of added chaos. So let’s focus our hunt on working the outlying areas of dry real estate where the deer will be traveling to and from to begin with. In an area like the edge of the bay your choices are pretty much made for you. You have a stretch of shoreline with water in the forefront and forest in the background. Obviously the forest is your setup and backdrop with the main curriculum of deciphering active deer trails. 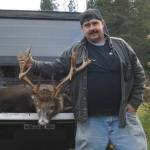 In essence, at this juncture, you’re pretty much on the same field as any other deer hunt. That is until you factor into the equation the contours of the shoreline and the immediate availability of cover found nearest to those contours. Fishermen understand this relation of shoreline mechanics when seeking active feeding schools of fish. It’s really the same basic procedure. Points that stretch out from the typical shoreline structure usually are accompanied by a change in shoreline vegetation. In most circumstances you also find a change in the bottom structure that isn’t visible without a little investigating. This bottom structure is key in finding areas of shoreline that will provide safety for whitetails. Deer are not equipped to walk along a bed of smooth polished rocks but are perfectly at home on a sandy shoreline. If your shoreline combines a good amount of vegetation such as reeds and new cat-tails then you have the necessary cover. If this area is in direct confirmation with forest growth on the shoreline and the means of soft bottom lake or bay structure then the elements are in place. What you have are deer at the very final boundaries of their home range that might push the limit out into the bay when the hunting pressure heats up. Pay attention to visual signs such as deer tracks that end at the water’s edge. Often you will find that they didn’t just step in for a drink but have ventured further seeking safety. Offhand I can’t think of anything that provides a deer better natural camouflage than an expanse of dead dried reeds along a shoreline so setup nearby if you expect deer are using this structure. Mornings, mid-afternoon, and evenings are your best bet. Early morning the deer should start filtering back to the safety of the water once gunshots start ringing out. By late morning to mid afternoon deer may move around a bit more or make their way back to the wooded shoreline providing you with a perfect ambush scenario. Dusk will be your next best choice if deer are holding in the reeds all day. They should begin to make their way back to the shoreline and onto their feeding and bedding areas for the night. In the case of such an area as Deer Island your choices are extremely limited. As I’ve already said I plan to write an article regarding that particular hunting area so I won’t give too much away but this calls for more drastic planning before the actual hunt. Deer in this situation have nearly everything they need including sparse food. In essence, if it weren’t for the lack of required vegetation, they would have very little need to leave the island. In it’s current state the island consists of mature cedars and balsams which canopy the larger percentage of sunlight from ever penetrating the forest floor. Without the presence of sunlight the underlying legumes remain dormant and those around the shoreline that do grow are scooped up quickly by the deer. In reality the island cannot support even a single deer but it does provide safety for numerous deer. The Northern side of the island is the flooded river due to a pair of beavers who have been there since I can remember. The remainder of the island is surrounded from the floodwaters that rise and decrease with the current weather conditions. It has only been in the very midst of a dry summer where the island was not completed surrounded by water. Unfortunately we do not have the option to hunt during this time of year so we deal with the water. In a case such as this any type of approach other than using a watercraft is useless. A kayak works best as there is the requirement of having to portage the craft to the other side of the beaver dam while carrying a flashlight and your hunting gear. Make yourself a pack and equip the kayak to hold as much as possible to relieve the stress on yourself. Lightweight and durable molded plastic kayaks provided the portability and the relative silence needed in this instance but even with the lightweight attention is still needed to your physical attributes. Stop when needed and take a break to catch your breath and avoid working up a sweat. When I said there was some drastic planning before a hunt of this nature I can’t really stress the very small details enough. If you suspect the deer in a situation similar to this are holding up throughout the daylight hours your best bet is an early morning hunt. Forget about the evening hunt in this spot as you’ll only chase the deer off the island unless it is much larger in size. In order to successfully complete a morning hunt you’ll also need to get moving several hours earlier than usual. Regardless of how much time it takes to get to the island you’ll need to be there well before the deer start coming back as this is their daytime bedding area. As I’ve mentioned in previous articles, I’m not the person you will typically find sitting on a stand all day. Being setup and waiting two hours before first light was grueling but that’s the type of commitment you’ll need to make when hunting an area like this. It’s the extra mile of motivation that will be the difference between success and failure when hunting a small island of pressured whitetail deer. In the end if you’re able to recognize the availability of similar hunting experiences in your neck of the woods it might just be worth getting your feet wet.